The best workout buddy you have is your dog – forever loyal, unboundedly enthusiastic and always complimentary. 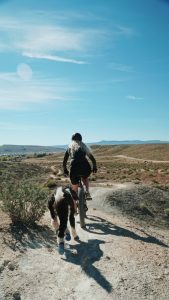 The US Department of Human Services survey into physical activity found that dog owners have moderate to excellent exercise habits whereas, only one in three adults participated in the amount of physical activity recommended each week. How much exercise your dog needs is down to the breed, but most vets agree that an hour a day is a good start. Working out at an established company can help train you and your dog and help you to maintain a stable exercise routine. However, working out at home with your dog is also a healthy way to take advantage of the opportunity to stay or get fit. There are some practicalities and considerations for making sure your workout space is safe for both you and your dog, for instance, safety of the space being used, specific requirements for your dog and the time of the workout. You wouldn’t suddenly start running through neighborhoods that you don’t know – to improve cardio, or picking up rusty old objects lying in the gutter- to increase muscle strength, because you know these things have an element of risk associated with them. Important in your backyard workout routine with your dog is that you secure the area and make sure that the exercise space for your dog is the safest that it can be by considering how to eliminate backyard dangers for dogs. The American Humane Association estimates approximately 4 million dogs get lost every year. Things like making sure there are no tunnels under your fence for your dog to disappear down, and conversely that your fence is high enough so that energetic springy dogs do not bounce their way out of your Zumba routine. Another priority in the dog owners mind is the safety of their workout buddy. A dog will have different exercise requirements and limitations if it is a Pug compared to a Great Dane. The first consideration should be how to improve the health of you dog as well as your own health, especially if your pet has not been used to exercising regularly. Increasing exercise for your dog will improve its heart, lungs and even joints. On a practical level and exercised dog has burnt off energy and is less likely to become destructive if left alone and bored. Varying obstacle courses in your yard and creating scent trails could fit with any type of dog. Practically speaking you need to exercise based around your work and homelife schedule and your dog will fit in kindly with that. However, you and your dog should not exercise outside if the weather is too hot or too cold. Instead think of challenging activities for inside the house such as running up stairs or hiding and chasing toys. No matter what the weather you should always have plenty of water at hand for the both of you. With the right training and support your dog can be your perfect workout partner. Your best friend will encourage you and will always be happy to exercise with you. It is up to you to consider the outside environment so that you and your dog can exercise safely.